First opened in 1928 under the name of Newark Metropolitan Airport and later known as Newark International Airport until assuming its current name in 2002 in recognition of those lost in the 9/11/2001 terrorist attacks, Newark Liberty International Airport straddles the boundary between Newark and Elizabeth and is located about 15 miles southwest of Midtown Manhattan.. The airport, which covers over 2,000 acres, is owned by the city of Newark and leased to and operated by the Port Authority of New York and New Jersey. Newark served just under 37.5 million passengers and was the site of about 400,000 plane movements in 2015. United Airlines is the dominant carrier, accounting for over 70% of flights from the Airport in the year ending March 2016; the most popular destinations from the airport, each serving over 700,000 passengers, were San Francisco; Orlando; and Los Angeles. In addition to Newark Liberty, the state also has approximately 42 other operating public use airports. The largest with scheduled flights in 2013 were Atlantic City International Airport, with over half a million passengers, and Trenton Mercer Airport, with slightly under 150,000 passengers. Teterboro Airport, operated by the Port Authority of New York & New Jersey and located some 12 miles from Manhattan, services many private aviation charter companies and private planes owned by corporations and wealthy individuals. Commercial air travel is primarily regulated by the Federal Aviation Administration, and the the state has no authority to license pilots or register aircraft. The NJDOT, however, through its Bureau of Aeronautics, licenses public use airports and almost 400 restricted use facilities, including airstrips, heliports and balloonports. The Bureau also issues permits for air shows, aerial advertising and sport parachute centers provides information about aviation grants and explains regulations to 14,000 Federal Aviation Administration licensed aviators. The airports and other facilities in the state serve as base to approximately 4,700 aircraft. New Jersey also is the site of the William J. Hughes Technical Center operated since 1958 by the Federal Aviation Administration in Galloway Township some ten miles from Atlantic City. The Center is the nation's premier air transportation system research and evaluation laboratory, conducting tests of systems and devices in air traffic control, communications, navigation, airports, aircraft safety, and security. The Center is also home to the Department of Homeland Security, the Federal Air Marshal Service Training Center, Transportation Security Lab, and the US Coast Guard Group Air Station Atlantic City, as well as the New Jersey Air National Guard 177th Fighter Wing. On July 12, 1928, while returning home from New York City on a goodwill flight which had originated In Mexico City--the third longest solo non-stop flight at that point in history--the Mexican aviator Emilio Carranza, called the "Mexican Lindbergh," was killed when he crashed during a thunderstorm in a forest near the village of Tabernacle in the Pinelands. 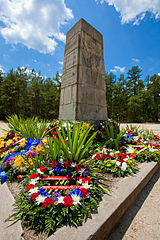 A monument at the site of the crash is the location for an annual memorial ceremony on the date of the crash. In the 1950s and 1960s, as the volume of flights and passengers grew, the potential construction of a new airport with longer runways able to accommodate larger jet aircraft, became a political controversy in New Jersey. The Port Authority of New York initially supported building a new jetport in the Great Swamp in Morris County, but opposition from environmental and communities impacted by the project ultimately led to the abandonment of the proposal. Subsequently, another proposal to build the project in the Pinelands to serve both the New York and Philadelphia markets also failed to advance. Trenton–Mercer is the fourth busiest airport in New Jersey, total of some 800,000 arriving and departing passengers in 2015. Located 12 miles from Manhattan, popular for corporate and charter flights for executives and celebrities. Owned and managed by the Port Authority of New York & New Jersey neral aviation relief airport located in the boroughs of Teterboro, Moonachie, and Hasbrouck Heights in Bergen County, New Jersey, United States. It is owned and managed by the Port Authority of New York and New Jersey and operated by AFCO AvPORTS Management. The airport takes up almost all of Teterboro and consists of 827 acres (3.35 km2): 90 acres (0.36 km2) for aircraft hangar and offices, 408 acres (1.65 km2) for aeronautical use and runways, and 329 acres (1.33 km2) undeveloped. The airport has more than 1,137 employees, of whom more than 90% are full-time. In April 2009 the FAA reported that the airport had the third highest rate of wildlife strikes of any airport in the United States based on takeoffs and landings (43 per 100,000). nation's premier air transportation system laboratory. conducts test and evaluation, verification and validation in air traffic control, communications, navigation, airports, aircraft safety, and security. National scientific test base for the Federal Aviation Administration. Technical Center programs include research and development, test and evaluation, and verification and validation in air traffic control, communications, navigation, airports, aircraft safety, and security. They also include long-range development of aviation systems and concepts, development of new air traffic control equipment and software, and modification of existing systems and procedures. Through a series of initiatives known collectively as NextGen, the Technical Center is contributing to the Next Generation Air Transportation System. Located 10 miles (16 km) northwest of Atlantic City in the Pomona section of Galloway Township, and covering over 5,000 acres (2,023 ha), the Technical Center consists of laboratories, test facilities, support facilities, the Atlantic City International Airport, and a non-commercial aircraft hangar. The Technical Center is also home to the Department of Homeland Security, the Federal Air Marshal Service Training Center,Transportation Security Lab, and the United States Coast Guard Group Air Station Atlantic City, as well as the New Jersey Air National Guard 177th Fighter Wing. While the Technical Center works mainly in aviation, it also provides other services for the Department of Homeland Security. Atlantic City International Airport joint civil-military airport 10 miles (16 km) northwest of Atlantic City in Egg Harbor Township, the Pomona section of Galloway Township and in Hamilton Township. The airport is accessible via Exit 9 on the Atlantic City Expressway. The facility is operated by the South Jersey Transportation Authority (SJTA) and the Port Authority of New York and New Jersey, which performs select management functions. Most of the land is owned by the Federal Aviation Administration and leased to the SJTA, while the SJTA owns the terminal building. The facility also is a base for the New Jersey Air National Guard's 177th Fighter Wing operating the F-16C/D Fighting Falcon, and the United States Coast Guard's Coast Guard Air Station Atlantic City operating the HH-65 Dolphin. ACY is also home to Coast Guard Air Station Atlantic City. CGAS Atlantic City was opened on May 18, 1998, and is the newest and largest single airframe unit and facility of the Coast Guard's air stations. It is a product of the merging of the former CGAS Brooklyn/Floyd Bennett Field, NY and Group Air Station Cape May, NJ into one unit. CGAS Atlantic City consists of 10 HH-65C Dolphin helicopters and it maintains two Dolphin helicopters in 30-minute response status. Approximately, 250 aviation personnel comprise the facility's full-time staff, The airport is next to the FAA's William J. Hughes Technical Center, a major research and testing hub for the Federal Aviation Administration and a training center for the Federal Air Marshal Service. It was also a designated alternative landing site for the Space Shuttle. The airport is served by Spirit Airlines which operates Airbus A319, Airbus A320 and Airbus A321 jetliners. Additionally, Caesars Entertainment has flights to cities east of the Mississippi River on its Total Rewards Air. This is offered as a scheduled charter year-round. United Airlines operated a series of flights starting in April, 2014, but decided the flights were not viable and discontinued service on December 3, 2014. The South Jersey Transportation Authority has outlined plans for massive terminal expansions (on top of current initiatives) which might be needed if more airlines serve the airport. Passenger traffic at the airport in 2011 was 1,404,119, making it the 102nd busiest airport in the country. The SJTA owns a small area around the terminal and leases runways and other land from the FAA. New Jersey Governor Chris Christie in March 2013 ordered a takeover of the airport's operations by the Port Authority of New York and New Jersey. Trenton-Mercer Airport Trenton–Mercer is the fourth busiest airport in New Jersey with an average of 203 aircraft operations per day, that approximately 399,000 passengers departed and 395,000 arrived at the airport between June 2014 and May 2015, a total of 794,000 passengers. (after Newark's 1153 per day, Teterboro's 434 per day and Atlantic City's 205 per day). Promotes itself as “The Best Little Airport in the East.” Located in Hunterdon County near Delaware River two miles outside Pittstown. Paved 2,900-foot runway. Hosts Skydive Jersey skydiving firm, Balloons Aloft and Alexandria Ballooning balloon flights.. Paved 2,900-foot runway. Located 3 miles east of Morristown and 27 miles from Holland Tunnel, promotes itself as "Metro New York's Global Business Connection." Hosts four aircraft charter operations, four flight training schools and three flying clubs.